All the ingredients contained within Shori High Growth Koi Food are selected carefully with dietetic studies and JPD technology. Shori Koi food is formulated with high quality fish and plant protein which combine to make a good digestibility for Koi. It should be noted that this Koi food is high in protein (45%) and low in ash (8.5%). The ash is digested slowly because high protein fish meal is used. Shori High Growth Koi Food contains astaxanthin which makes the red redder and vitamin C which makes the white whiter, these ingredients make a shiny beautiful body. 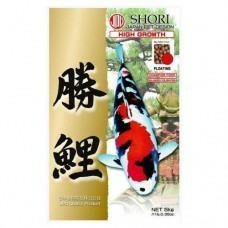 Shori High Growth Koi Food is enriched with astaxanthin. Shori High Growth Koi Food is also formulated with probiotics which reduces the waste in the water and regulate the functions of the intestines within your Koi. Another benefit of the of this formula id that the food doesn\t degreade the water quality because the pellet keeps it\s shape for a long time in the water resulting in cleaner clearer water.